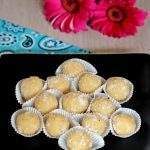 makes a great evening snack with a cup of coffee or tea. 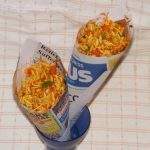 Diwali is never complete without mixture. 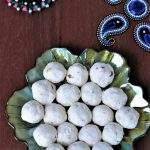 The traditional South Indian mixture has many individual components that are then combined. Making the traditional mixture is quite time consuming and hence many times I just end up making the kara boondhi by itself or the Oma podi / sev by itself. This Kara pori mixture /Murmure mixture is the perfect alternate to the traditional mixture without being too time consuming. When I went to one of my good friend’s house recently, she had made a big batch of this kara pori mixture to snack on. I fell in love with it and had to ask her the recipe to make it. So, this recipe is given to me by my dear friend Ranganayaki. 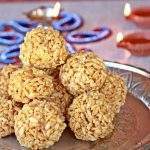 The recipe fit right into my theme for this week, which is Diwali sweets and savories. I chose to make quick and easy recipes that can be made under 30 minutes. I had bought a big batch of traditional South Indian mixture when I came from India, and just recently we finished the whole batch. My son was missing the mixture really bad as he loved to munch on them right after he got back from school. He was very excited when I made these yesterday and had been happily munching on it after school. He loved the addition of the raisin and asked if I could add a little more. Then comes my little one from school and when he ate the murmure mixture, he said that he loved it except for the raisins and asked me, If I could make it next time without the raisins. I came up with the perfect solution that made both of them happy. I picked out the raisins from my little one’s bowl and added it to the older one’s bowl. They both got what they asked for. Don’t we mother’s have the perfect solution to all the problems? 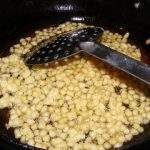 When making this mixture, use a large pot. It makes it easier to stir as there could be a lot of spilling otherwise. Also make sure that you have all the ingredients measured and lined up as they go in quickly one after the other into the pot. 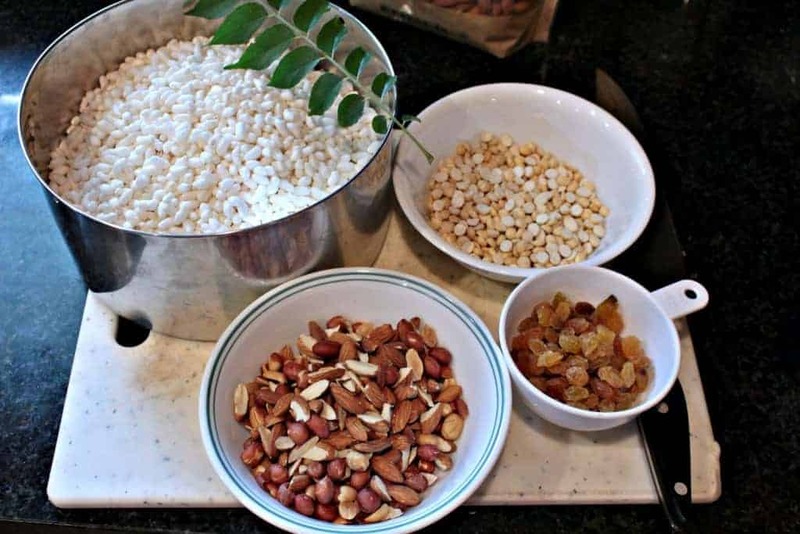 Sliced dehydrated coconut could also be added to the Kara pori mixture. I did not use any as my little one is not a big fan of coconut. Measure all the ingredients and keep them ready before we start making the mixture. ll the ingredients go in one after the other in a quick order and hence keeping everything measured and ready helps. We need a large (tall) pot to make the mixture as mixing would be a easier. Heat the oil and add the mustard seeds. Once the mustard seeds crackles, add pottu kadalai/roasted gram and fry until it is lightly roasted and light brown in color. Next add the almonds and the peanuts and let it fry as well until lightly brown. Now add the curry leaves and let it fry. Add the raisins and fry for couple of minutes until the raisins are puffed up. Now add the asafetida, turmeric powder, salt, and give a good mix. Add the red chili powder and right after add the puffed rice and mix well. It helps to hold the handles of the pot and shake the pot to help thoroughly mix. 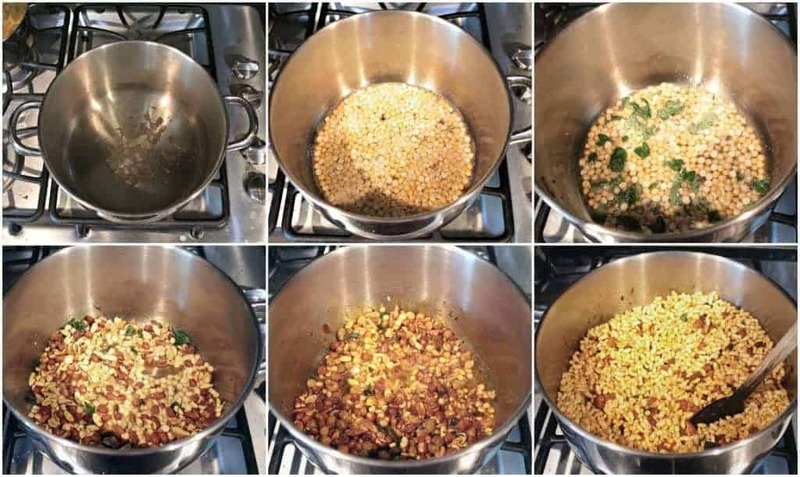 Let the puffed rice remain in low heat for 4 to 5 minutes to make it crunchy. Keep mixing the mixture to avoid burning. Let the mixture cool down entirely before storing in an airtight container. While our mixture is something we also make for every deepavali, this pori mixture is almost a monthly affair, even my boys like it. so I end up making it often..you nailed it so well..good one! Thanks Valli! This will be a regular at my home now. In my house this mixture isa regular affair. If I do not make it hubby buys it and I cannot eat it as it has too much garlic. Love your solutions for the demands of the kids. We mom have them all the time. Thanks Veena! It is quite addictive. 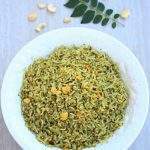 Sandhya whenever I make mamra snack, I just add a bit of sev and hubby doesn’t eat it. After seeing your recipe I know how to make it more exciting…. add nuts. Brilliant idea. Thanks Mayuri! Glad you will be able to make it for your husband. what a coincidence! I too have made the same mixture with a little variation to post under diwali recipes next week. Looking forward to your post Ritu! I love pori mixture.. homemade is always the best..
Definitely homemade is the best. We can add as much or as little of any ingredient in it. This is so addictive. One of my all time favorites. Love your pictures – both step by step and the end result. 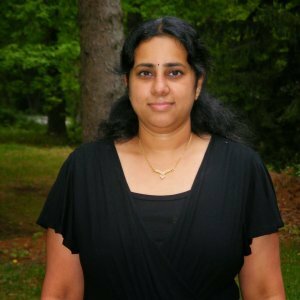 Thanks Varada! They were very addictive. 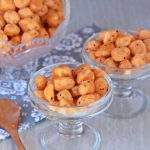 I used to eat plain puffed rice as cereal and loved it! I think this is a great way (and definitely more flavorful) to try it next! I agree. 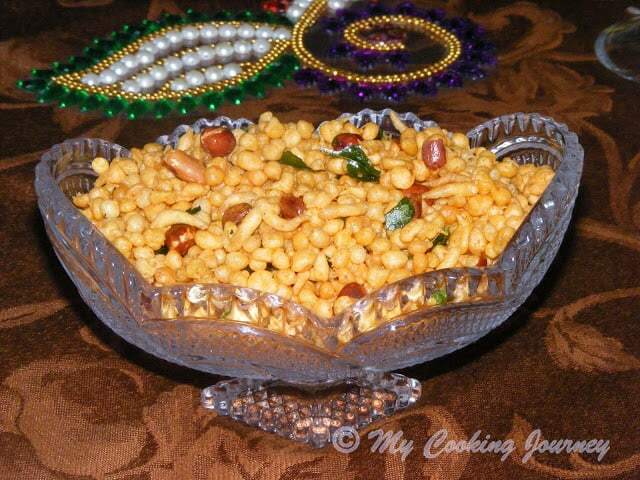 Love the puffed rice cereal and this more so because of all the spice. I’ve never heard of some of these seasonings and spices before. I bet they are quite tasty with the puffed rice and nuts! Looks like a great snack. Joanna, the seasonings and spices used are the common ones used in most of the Indian recipes. If you need any help finding them, let me know and I will be more than happy to help. Thanks. 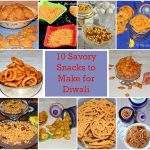 Definitely an easy and quick mixture to prepare when we dont have much time to prepare a savoury for Diwali, thanks for sharing. This looks so tasty! 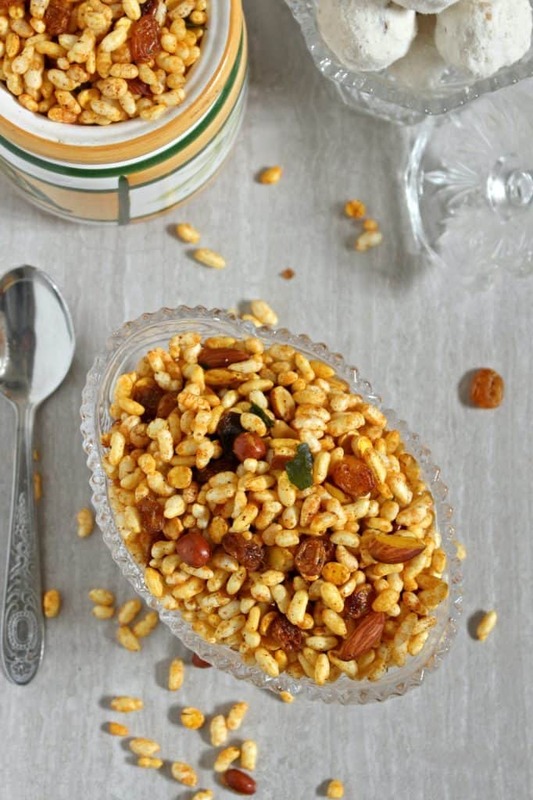 I love puffed rice and this sounds like it has a great combination of flavors and textures. 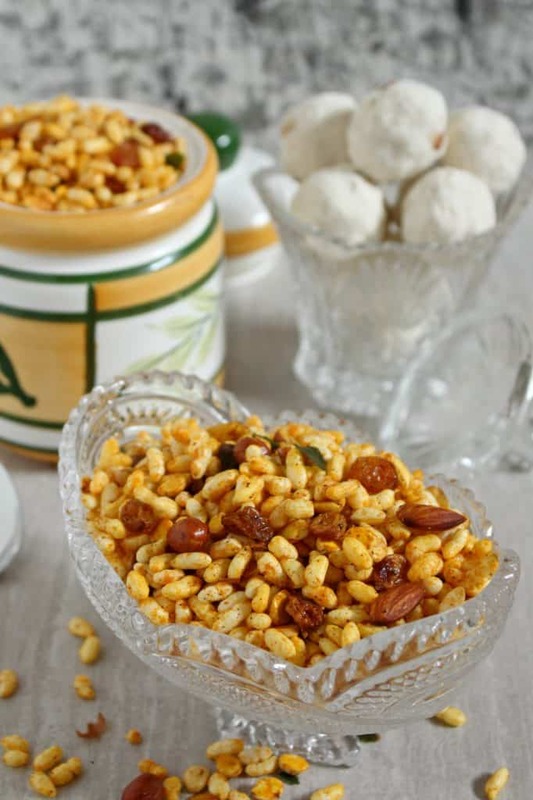 What a tasty idea for puffed rice…this looks like such a delicious mix! Thanks Catherine! I had a huge bag of puffed rice and I put it to good use. Mixture is in the todo list this Diwali! 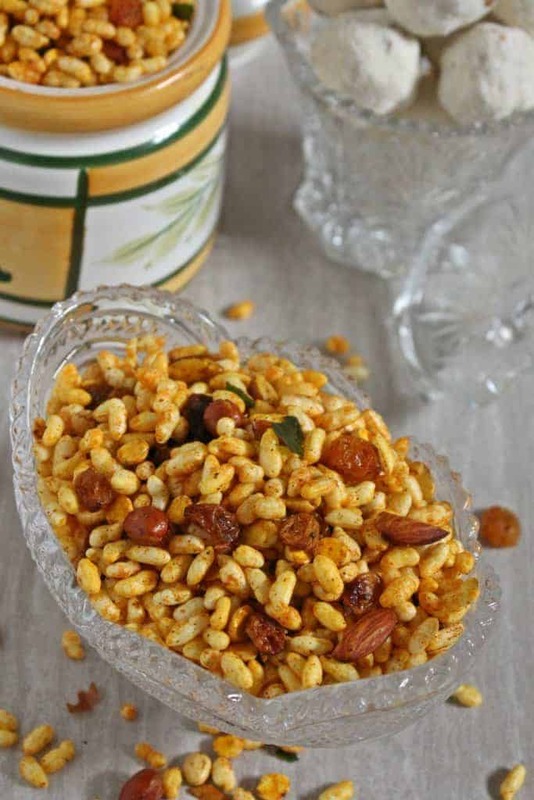 Loving the varieties i m seeing this BM , this puffed rice mixture looks delicious and pretty easy to Make! I loved it too Priya! This is done way before Diwali came, so I have another opportunity to try something new. I love puffed rice chewda! This is kinda a chewda right? 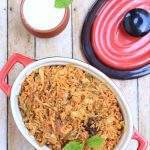 I usually make mine with poha (beaten rice) and this sounds so absolutely delicious. 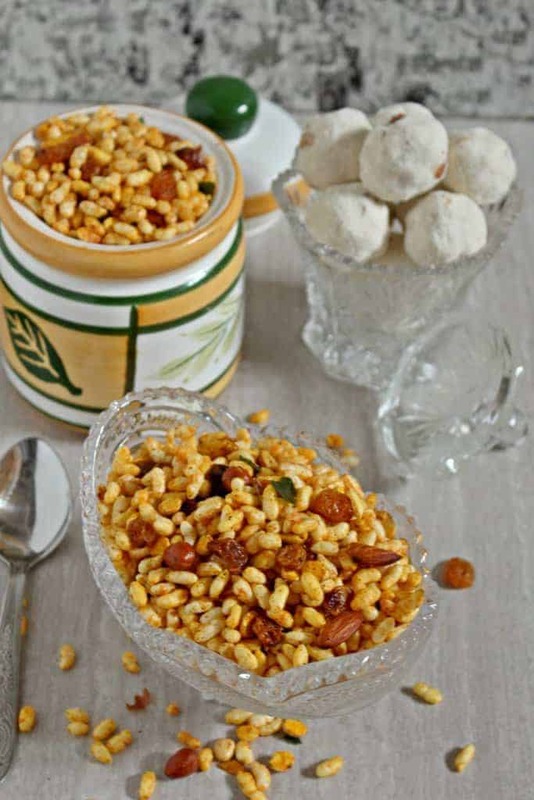 The next time I have puffed rice I’m making this for sure. Saving for now. YUM! Yes veena, This is a kind of chewda. Just with puffed rice for a variation. I’ve never had these before, but oh my goodness they look delicious! I’d love to try them out soon. Saving this recipe! This looks delicious! 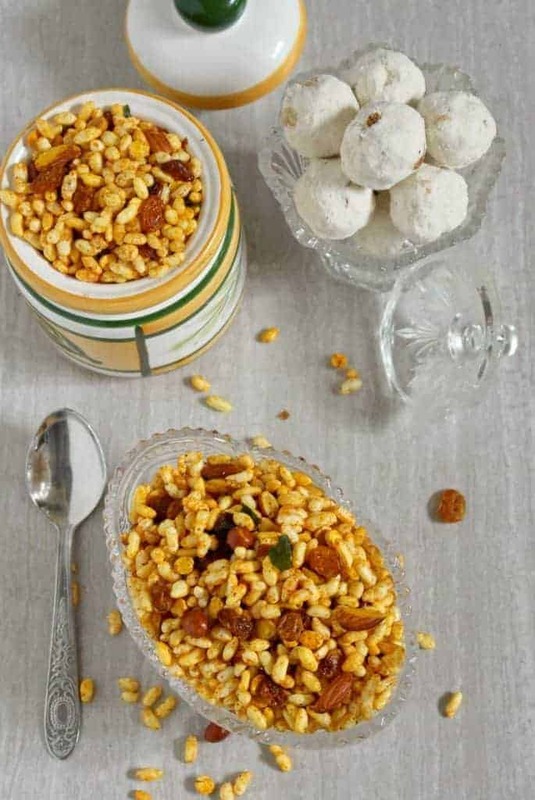 The puffed rice looks especially good. We’ll have to give this a try! Home made fresh mixtures are always so delicious. Looks awesome.